The new 3.0L Pentastar V6 was introduced in China in the 2014 Jeep Wrangler and 2014 Jeep Grand Cherokee with 230 horsepower and 210lb-ft of torque. Like the 3.6L Pentastar that is used in almost every Chrysler Group vehicle sold in the US and the 3.2L Pentastar V6 that is featured in the new 2014 Jeep Cherokee, the 3.0L version of the Pentastar will be built at the company’s Trenton Michigan engine facility. After they are completed, the new 3.0L Pentastar V6 will be shipped exclusively to China for use on those two 2014 Jeep models. This new engine uses the same 60 degree engine block design as the popular and powerful 3.6L Pentastar that so many Americans have opted for when making a Chrysler Group vehicle purchase but as of right now, this new 3.0L mill will not be offered in the US market. The Pentastar engine family was introduced in March 2010 with the 3.6L V6 in the then-new Jeep Grand Cherokee. Since then, that Pentastar engine has replaced a long list of other V6 engines in everything from the Chrysler 200 to the Dodge Challenger to the Ram 1500. The 3.2L Pentastar was introduced specifically for use in the all-new 2014 Cherokee and now that this newest 3.0L Pentastar has been unveiled for the Chinese market Wranglers and Grand Cherokees – every Chrysler V6 in use around the world is a Pentastar. In total, these three Pentastar engines have effectively replaced seven Chrysler V6 engines that did not use the modern Pentastar architecture. Once the full scale rollout of the new 3.0L and 3.2L Pentastar V6 engines is complete, Chrysler will have 16 vehicles packing Pentastar power in 11 different automotive segments with only six vehicles in the company arsenal NOT offering a Pentastar V6. Below is a list of how the Pentastar V6 engine family is used in the current Chrysler Group lineup. -Chrysler - All three current vehicles (200, 300, Town & Country) all offer the 3.6L Pentastar V6. -Jeep - In the United States, the Grand Cherokee and Wrangler both come with the 3.6L Pentastar while the new Cherokee relies on the 3.2L Pentastar – leaving only the Compass and Patriot without Pentastar power. As an interesting note, all of the current Pentastar V6 engines have debuted in Jeep products. - Ram – This brand consists of only three vehicles, the Ram pickup, the new ProMaster and the Ram C/V – all of which come with the 3.6L Pentastar. -Dodge – The Dodge Dart is the only model from the current Dodge lineup that does not come with the Pentastar V6. 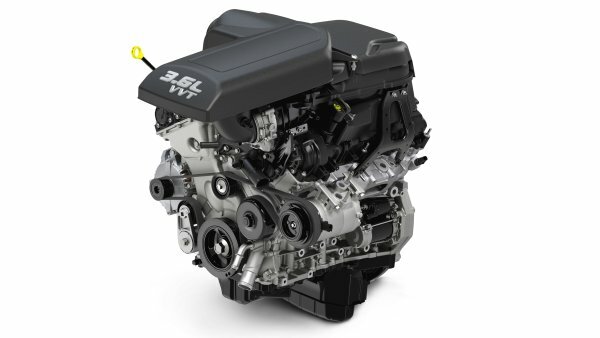 The Avenger, Challenger, Charger, Durango, Journey and Grand Caravan all feature the 3.6L Pentastar V6. -Fiat – This is the only Chrysler Group brand in the US not to offer a vehicle with a Pentastar V6…but the Fiat lineup doesn’t offer any V6 engines for the Americas. However, the Fiat Freemont that is the European version of the Dodge Journey does pack Pentastar power in those overseas markets so even Fiat makes use of the Pentastar engine family. -SRT – Needless to say, there is no Pentastar option for the 2013 Viper. “When the Pentastar was conceived, we started with a clean sheet of paper and the goal of producing an engine that made the most sense for the customer and for us,” Lee said. Based on the success of the Pentastar both here in the US and around the world – it is clear that the Chrysler Group engineers succeeded in their goal.